very sharp knife, begin by cutting through the parson's nose. 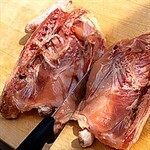 Place the chicken skin side down, open it out flat like a book and cut right through the breastbone. 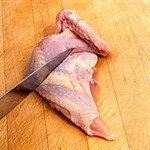 Now turn the chicken halves over, stretch out the leg and cut through the line dividing the leg from the breast. For six portions, turn the legs over, find the thin white line at the centre of the joint and cut through it. If you need eight portions, simply cut the breast portion in half.